It can be quite difficult to understand dialectics given the nature of the topic and the difficult language that is used. Here I will attempt to make understanding Mao’s Tse-tung “On Contradiction” easier for someone new to it to understand. The universality of contradiction is well known, this is the basis for all of dialectics. No one in dialectics disputes this. All things have contradictions in them. This universality has a twofold meaning. Contradiction exists in the process of the development of all things. In the process of development of each thing, a movement of opposites exists from beginning to end. The problem that arose here is that some denied the existence of contradiction at the beginning of each process. The Soviet Deborin school claimed that contradiction did not appear at the beginning of a process. They claim it appeared only when a process has reached a certain stage. This is essentially claiming that the cause of development, before the contradiction appears, would be external and not internal. This would be claiming that contradiction is not universal. We know external influences are secondary to internal causes. The Deborin school is using metaphysical theories of external causality. They are incorrectly asserting presence or absence of contradiction. They should be seeing different kinds of contradiction. Contradiction is universal and absolute, it is in every process in the development of all things. The truth of contradiction within a process is as follows: The old process with its own contradictions creates the new process that has its own contradictions. At no time is there an absence of contradictions within a process. Every form of motion has its own particular contradiction. The particular contradiction is what makes one contradiction distinguishable from another. The differences in the motions of matter come from the differences in contradiction. The difference in the motion of matter can be seen in many different things. “There are many forms of motion in nature, mechanical motion, sound, light, heat, electricity, dissociation, combination, and so on. All these forms are interdependent, but in its essence each is different from the others. The particular essence of each form of motion is determined by its own particular contradiction.” This is the same for every society and every form of ideology, they each have their own particular contradiction and particular essence. These particular contradictions make up and determine the basis of each science that investigates each motion of matter. In mathematics there is positive and negative numbers, in chemistry there is dissociation and combination, classes and class struggle in social science. Dialectics is universal contradiction, it is in everything everywhere. if we do not accept this we can never understand how matter is in motion, thus preventing us from understanding the development of things. If we don’t study the particularity of contradiction we have no way of understanding the essence of a particular contradiction that which makes it different from other contradictions. We need this to learn, “the particular cause or particular basis for the movement or development of a thing.” Without it we wouldn’t be differentiating between different fields of science. The same can be seen in the development of mankind’s knowledge. First he knows himself and knows particular things about his existence. With that basis he can expand his knowledge to a general knowledge of things and subjects. This means a person has to learn the specific essence of many different general things before he can know the common essence of things. This is the basis for the two processes of cognition: from the particular to the general and from the general to the particular. When the scientific method is followed properly this cycle advances mankind’s knowledge to higher and higher stages. These two processes of cognition are connected, they make up the whole of the Marxist Theory of Knowledge. The main point Mao is making in this is how a good and proper investigation is supposed to be carried out. Study each particular contradiction and the essence of it. Study the particular contradiction and the essence of each process in the long course of development of each form of motion and matter. In every form the development which is material, is qualitatively different. Each qualitatively different contradiction can only be resolved with a qualitatively different method. For example: contradiction between the working class and the capitalist class is solved by the method of socialist revolution. This recognition that it takes different methods to resolve different contradictions is one Marxist-Leninists must follow. Subjectivity must never be used in investigation. This also comes with the rejection of one-sidedness and superficiality. We must look at it objectively and not use the materialist view point. The key is to look at problems from all sides. this would be looking at the individual parts and not the whole. It would be not looking at the characteristics of both aspects of a contradiction. The fundamental contradiction in a process of a development of a thing (and the corresponding essence determined by that contradiction) will not disappear until that process is completed. However, in a lengthy process the conditions differ at each stage. Along with this, some of the major and minor contradictions (which are influenced or determined by the fundamental contradiction) will intensify, some temporarily or partially be resolved and some new ones will emerge. This shows that the process is marked by stages. If this is not acknowledged, its contradictions cannot be dealt with properly. When studying the problem of the particularity there are two points we must remember to look at for analysis: the principal contradiction and the principal aspect of a contradiction. In the process of the development of a complex thing there is a principal contradiction. This one contradiction has the ability to develop, influence the existence of, and/or determine other contradictions in the process. 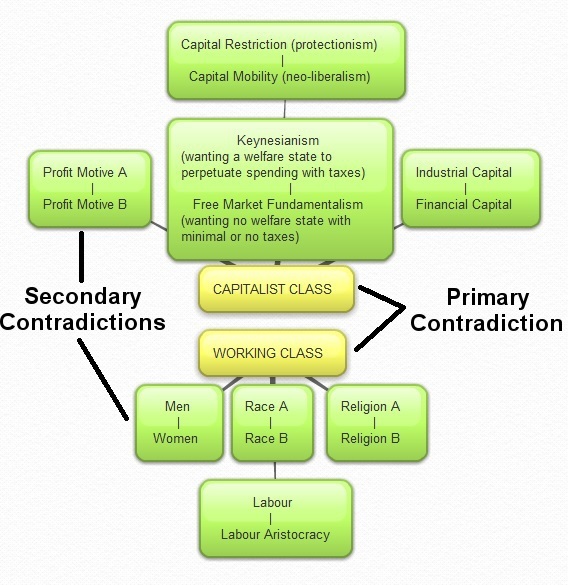 As a brief example we can show the principal contradiction between the proletariat and the bourgeoisie. This influences the contradiction between different groups of bourgeoisie. One group of capitalists want a “freer” bourgeois democracy to help smaller capitalists, while bourgeois fascists would rather have as little in the way of regulation that would help smaller capitalists compete. There is the principal contradiction of classes and it influences the contradiction between the interests of different groups of capitalists. When American imperialists launched their war against Iraq, Iraq and the imperialists became the principal contradiction. The various rival (in contradiction) groups temporarily unite as a force against the invaders. Sunni and Shiite militants who normally fight each other, began to work together. The new primary contradiction of Iraq/US Imperialism influenced and altered the contradictions between normally rival militant groups. When dealing with a complex process we must identify the primary contradiction, then identify the secondary or subordinate contradictions that will be influenced by the primary one. This is the method used by Marx in studying capitalist society. This is the same method used by Lenin and Stalin in studying imperialism and the general crisis of capitalism and when they studied the Soviet economy. When looking at the principal contradiction we should not see both aspects as equal. One aspect will be seen as primary and the other as secondary. At times it may appear as though they are in equilibrium, but it will only be temporary or be an illusion. The principal aspect will play a leading role in the contradiction, once it has gained a dominant position. For us, this would be the capitalist class who owns the social power and the repressive mechanisms. This situation is not static. The two aspects influence each other and may change the nature of things. There be a switch of positions where the principal aspect becomes the non-principal aspect. This occurs due to increases and decreases in the force exerted by an aspect. This also applies to “the new superseding the old”. It is a general and eternal law that one thing transforms into another. This transformation takes place due to its essence and external conditions. In this process there is contradiction between its new and its old aspects. This leads to a series of struggles. These struggles take the new aspect(s) from being minor to major. The reverse is true of the old aspects. The new aspects take over, changes the thing qualitatively into a new thing. After you understand the universality and particularity of a contradiction, you must move onto understanding the identity and struggle of the aspects of a contradiction. In the process of the development of a contradiction there is two aspects to it. They presuppose each other’s existence and the both exist in a single entity. In given conditions each of the two contradictory aspects transforms itself into its opposite. This is the meaning of identity. There are contradictory aspects in every process. They exclude each other, struggle with each other and are in opposition to each other. This happens in the process of development of all things including human though. A small process may contain only a single pair of opposites. A complex process will have any number of them. In addition, pairs of opposites are in contradiction with each other. This is how all things in the objective world and human thought are made up. This is also how they are set in motion. From this we might get the idea that there is no unity and no identity. This is not true and is explainable. None of these contradictory aspects can exist in isolation, they need each other in order to exist. Can any contradictory aspect exist independently of its opposite? Cold cannot exist without hot, without life there can be no death, there is no above without a below. Without landlords there are no tenants. Without a bourgeoisie there would be no proletariat. This is how on one hand they are opposites and in contradiction; while on the other hand they are interconnected and interdependent. This character is what gives them their identity. They only have an identity as they are connected. This does not end with merely acknowledging that their contradictory aspects are necessary for each other’s existence. What we also need to include is their transformation into each other. In given conditions each of the contradictory aspects within a thing transforms itself into its opposite, changes its position to that of its opposite. This transforming into its opposite is what revolution is about. The process of revolution takes the contradiction of the proletariat and the bourgeoisie and makes that change. The proletariat goes from ruled to the ruler. The bourgeoisie from ruler to being ruled. They each take the position that was occupied by its opposite. If there was no identity of opposites, how could such a change take place? If this is identity, then what is struggle? What is the relation between identity and struggle? The two contradictory elements in a thing have two states of motion. First a state of relative rest and second, that of obvious change. The first is quantitative change and can appear outwardly as being at rest. The second is the qualitative change that is very visible when the first reaches a boiling point. The two opposite things can coexist in a single entity and can transform themselves into each other because there is an identity between them. Two contradictory things can be united and transformed under certain conditions, under different conditions they cannot be united and transformed. This is what is meant by conditionality. The identity of opposites in existence is conditional and relative. The struggle between opposites exist from beginning to the end of a process. Because of this we say struggle is unconditional and absolute. The movement of opposites of all things is as follows: conditional, relative identity and unconditional, absolute struggle. When we are looking at the question of contradiction we also look at the question of “what is antagonism”? It doesn’t see contradiction, it doesn’t believe the two classes have separate interests. It doesn’t see how that contradiction leads to antagonism. If their theory was true, revolutions would never have happened. We do however have to keep in mind that we must do a concrete study of all the circumstances of each struggle of opposites. Contradiction and struggle are universal, but the method of resolving them is not. Some have open antagonisms while others do not. Some have the antagonisms develop after a certain amount of time or changes in condition. If you should be so incline, you can read Mao’s “On Contradiction” here.